Editor’s Note: This is part two in a series of five articles looking at memorable depictions of coming of age on television — a favorite topic on the small screen, from “Leave It To Beaver” to “Pretty Little Liars.” It’s presented in partnership with Participant Media’s new network Pivot and its series “Please Like Me,” about a 20-year-old man (Josh Thomas) who still has a lot to figure out about identity, love and family. Catch all six episodes back-to-back at 8pm ET/7pm CT on Thursday, August 1. In the late ’90s there was no shortage of television teenagers grappling with identity. On the multi-year mentorships of “Boy Meets World” and “Buffy the Vampire Slayer,” that meant learning how to be a responsible grown-up, how to prioritize and sacrifice and do the right thing. On the stuck-in-your-own-head soap popera “Dawson’s Creek,” that meant growing out of childish self-centeredness and accepting that you’re not the only person on the planet with valid feelings. And on “Felicity” and “Freaks and Geeks,” that meant trying on different hats and discovering who it is you really want to be. Heroines Felicity Porter and Lindsay Weir both undermine high-achieving academic careers as their shows begin, but where Felicity’s caught between two guys, Lindsay’s caught between two lives. “Freaks and Geeks” begins with Lindsay (Linda Cardellini) just starting to drift from her old life. She was a straight-A student, a star mathlete and a model daughter, and then her grandmother’s passing unmoored her. She begins to question her religion, her goals, her friends. She even changes her look, shedding girlish dresses for an army jacket. Soon she falls in with a gang of so-called “freaks” who cut class and smoke in the yard: Daniel (James Franco) the lost leader, his unfiltered girlfriend Kim (Busy Philipps), Nick (Jason Segel) the stoner and Ken (Seth Rogen) the wiseass. Meanwhile, Lindsay’s brother Sam (John Francis Daley) is a short freshman who likes model rockets and “Saturday Night Live.” He isn’t rebelling yet, but he is starting to discover that people see him as a geek, and he’s trying to figure out how to change that. It’s hard to identify a single episode in this truncated series that encapsulates Lindsay’s coming of age, because in its sadly brief run she barely has time to try on her new identity, much less grow into it. But a little over halfway through the season comes an indelible benchmark for the character in “Looks and Books.” Written by creator Paul Feig and directed by Ken Kwapis, the episode begins with the freaks pressuring Lindsay into stealing her parents’ station wagon to pick up an amp and then making such a ruckus that she crashes it. Lindsay gets grounded and forbidden from seeing the freaks anymore, which is fine by her, because she’s more traumatized by the crash itself. When her geeky, goody-goody mathlete friend Millie (Sarah Hagan) stops by to check on her, she reminds Lindsay of a happier time, and Lindsay starts to try her old life back on. She breaks up with the freaks and rejoins mathletes, puts away the army jacket and embraces the button-down and ankle-length skirt. But what’s really interesting is she doesn’t reject the freak life. Even though she has had a nasty, public falling out with her friends, she defends them to the snotty mathlete girl who gossips about Kim. She doesn’t even deny the false rumor about Kim’s pregnancy. It’s about the principle. Instead Lindsay tells her that people living their lives differently from her doesn’t make them worse. It’s a lesson that Lindsay is learning herself. Sam’s story reflects that idea, too. He buys a jumpsuit because the salesman promises it’ll make him a super-stud, but it’s so ridiculous he just winds up embarrassing himself in front of everyone. 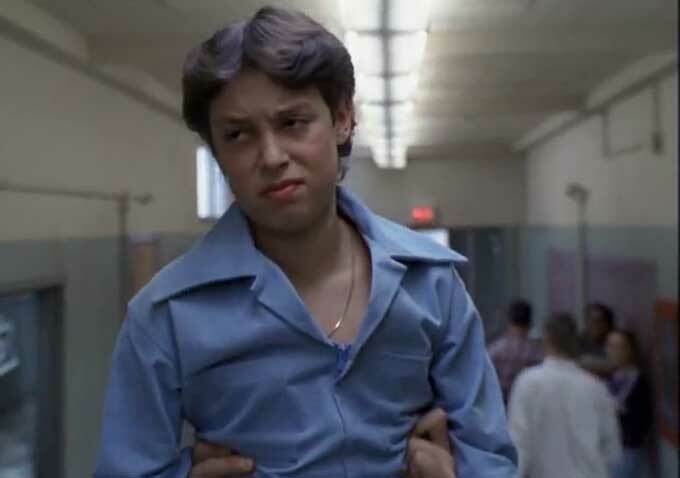 At the end he cries in frustration to the guidance counselor, Mr. Rosso (Dave Allen). And Mr. Rosso tells him that it’s not about how others see him but about how he sees himself that matters. Cool is in the eye of the beholder. After dominating a math competition, Lindsay realizes she doesn’t need external validation, either. That’s not as satisfying as seeing her freak friends show up unexpectedly to cheer her on. They even bring a replacement fender for the Weir station wagon. That night, at a slumber party with the mathletes, Lindsay realizes she doesn’t belong there anymore, and she sneaks off. Millie just stands there half-lit in the doorway watching her go, and for the second time Lindsay gives up her old life, this time for good. She’s not just a tourist. This time she knows she can’t go back again. Indiewire has partnered with Pivot and its new series “Please Like Me.” (Binge-watch the whole season starting at 8pm ET/7pm CT on Thursday, August 1, with a total of six back-to-back episodes.) “Please Like Me” is a comedic-drama based on actual painfully awkward events from the life of 25-year-old, award-winning Australian comedian Josh Thomas. Watch the first episode here, as in the span of 24 hours, Josh is dumped by his girlfriend, realizes he may be gay and moves in with his mother, who has just attempted suicide. All of a sudden, it seems as though everyone’s life is in disarray and Josh is at the center of it all.